Hands down proper Detroit gear, timeless classic material here, if that's what you're after - look no further! Coming on strong way back in '87 on the legendary KMS label 'When we used to play' is 4 solid as cuts, stripped back box jams, sleazy vocals and samples and ultra-jacking rhythms! 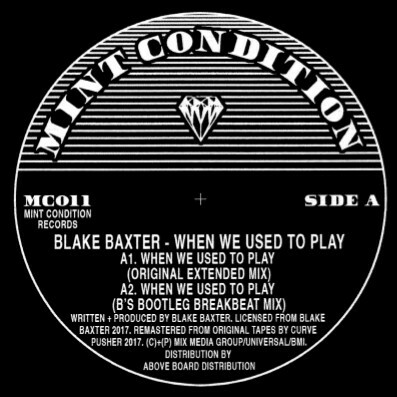 This one's for the heads and is the first of 2 Baxter 12"s that Mint Condition will be presenting to you! Trademark deep basslines and sultry atmospheres are what Baxter does best and this is one of the first, and best, examples of his unique flavour of house and techno. There have been a few bootlegs of this classic EP floating around for a few years, but this pressing is the real deal, a solid collabo between Mint Condition and Blake Baxter. An essential cornerstone of one of the most important musical scenes in dance music indeed - Every home should have one! 'When We Used To Play' has been legitimately re-released with the full involvement of all license holders for 2017 and remastered by London's Curve Pusher from the original sources especially for Mint Condition. 100% legit, licensed and released. Dug, remastered, repackaged and brought to you by the caring folks at your new favourite reissue label - Mint Condition!